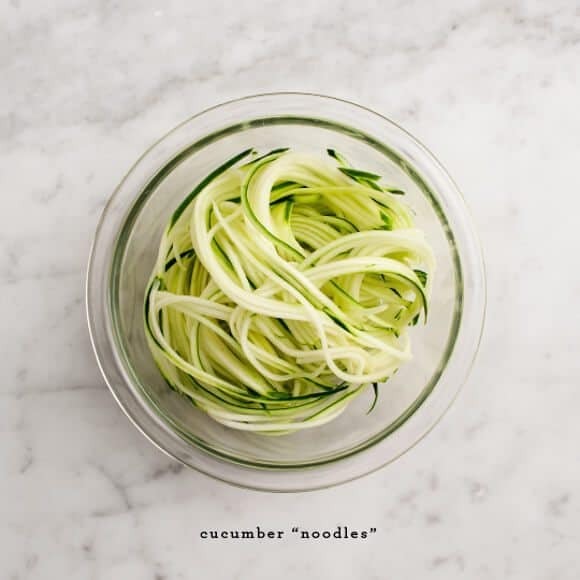 A healthier noodle dish that uses spiralized cucumber in place of half of the noodles. 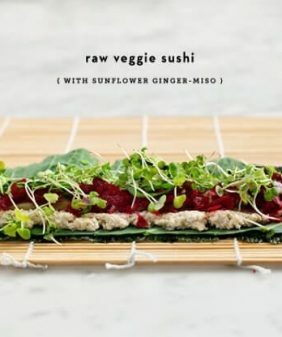 Fresh, healthy, vegan and gluten free. I guest posted the other day at Turntable Kitchen. Kasey and Matt are in Japan, which is one of the places Jack and I loved the most. We spent a week in Kyoto and one of the first things we set out to find was soba. It’s served in teeny tiny hundred-year-old restaurants. The noodles are handmade, and cold soba is served plain with a dipping sauce. Just dip and slurp. The louder the better. Since the soba I make at home comes from a box I, of course, add stuff. But I try to keep it simple. We’ve been loving this version lately where the cucumbers are sliced into nearly the same shape as the soba. It’s a great refreshing option for summer because you feel like you’re eating bowl full of noodles, but with half as many actual noodles. You would never see avocado with soba in Kyoto, but, well, I’m not the one that’s in Kyoto right now. 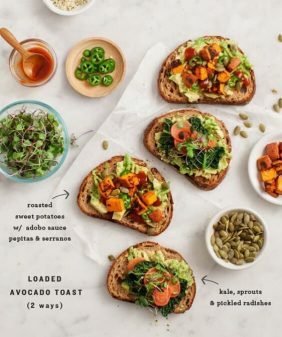 So bring on the avocado. Boil the soba noodles in salty water until al dente. Blanch them for 30 seconds in a bowl of cold ice water, then drain. 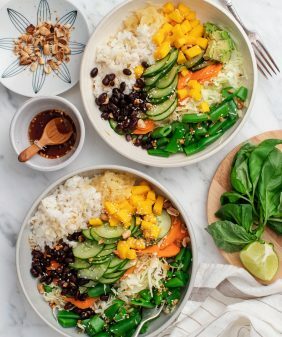 Return them to the (empty) bowl and gently toss with a splash of sesame oil so they won’t stick together while you finish everything else. Thinly slice the cucumbers using a julienne peeler. (you could also use a mandolin or veggie spiraler). Discard the first peel (it will be all skin) and carefully make your slices around the seeded part in the middle. 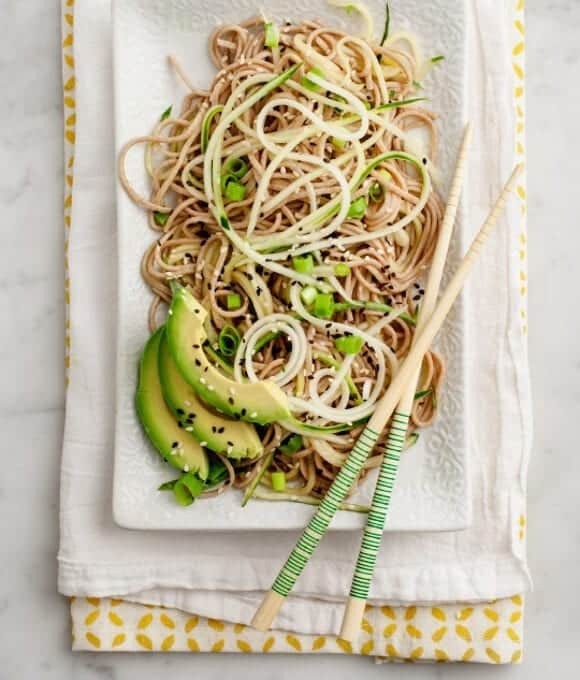 Toss the cucumber slices and scallions with the soba noodles. And tamari, rice vinegar, and ponzu and toss again. Taste and adjust seasonings. 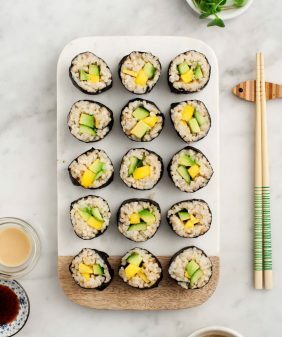 Top with sliced avocado and sesame seeds. Serve cold. I have this julienne peeler. It’s a gadget worth getting because it takes up no space in your drawer. There are less expensive ones… I went for this one because it had good reviews and it wasn’t a wacky neon color. I love cold noodles, much better than the hot thing sometimes! I like pickled cucumber and radishes to serves with noodle salads. The peeler is s god sent to me with poor cutting skills! I can live with out it. Your photos do such a good job at conveying the clean, crisp feeling you get with these noodles. Awesome recipe. I love a good soba noodle. I always get them when I am at Whole Foods in the prepared food section. I’ve never made them at home, but this recipe is calling my name. PERFECT for a warm summer day! Love soba noodles. Looks delicious! My first question was going to be how do you julienne your cucumbers that way. With your nifty gadget, I see. Thanks for posting about it. Such a thing might help me out with spring roll preparation, too. Your Asian dishes are exactly up my alley considering it’s now too hot to use my oven (though I do anyway). Just tried your edamame hummus, which is tasty. Not Asian exactly, but what I was looking for in the cool department. 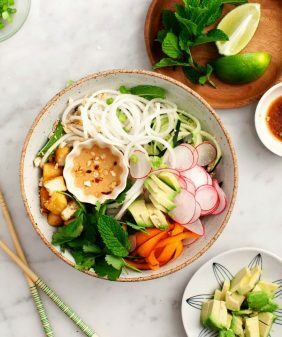 It’s a handy little tool to have – I make green papaya salads & zucchini noodles with it too so I’ve definitely gotten my use out of it. Glad you liked the hummus – I made it one day when I just didn’t have any chickpeas :). This sounds amazing, Jeanine. I love the ribbons of cucumber! So great to meet you this weekend! This is so amazing. I love everything about it! Why have I never tried soba and avocado? This is brilliant. And beautiful. Lacking cucumbers and the energy to run to the store for one, I might try making this with ficoïde glaciale. It’s water-crisp, like cucumbers, but with a briny-lemony flavor. Really good with soba (http://www.plantandplate.com/2013/03/ficoide-glaciale-and-soba-noodles/) and I suspect it would be excellent with the avocado – sesame goodness of your recipe. And then I can make the whole thing again tomorrow with cucumbers. I really need to learn to make my own soba noodles, though. I’ve never even heard of ficoïde glaciale before, I’ll have to keep an eye out for it now, sounds fascinating! Love this! I’m always looking for simple soba combos. Thank you! I tried this witout any added protein. Instead i had just baked some bread. It was a great combination! Thanks. 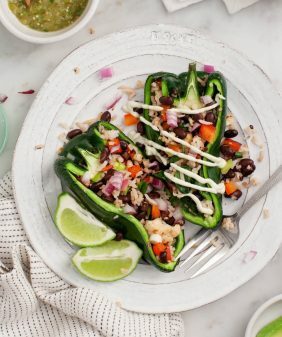 YUM — this is immediately getting added to my list of easy summer lunches, there’s nothing like a cold summer salad or pasta of any sort to make a meal feel instantly effortless! Made this today and enjoyed it on a sunny porch overlooking a blue lake. A summer dinner doesn’t get much better than this! Substituted cucumber with zucchini cause that was what I had on hand and added some leftover grilled chicken. Delicious. ha, thanks. Hope you like it! There are a lot of sites that I like and among them your site is my favorite. I am a regular silent member, but sometimes I like to comment to let you know you are doing a great job. I was reading Lemon and water health benefit on this site when I search your site. I constantly read informative articles that you post. You know what I think your site offers such good information that I am going to bookmark it so that I can visit it again. I was going through various website when I come your and this Lemon and water benefit post. Name of your site is difficult to write otherwise I would have remember it by know. Wow! thankyou for this amazing article. I never thought it was so easy to have a lemon water detox. I really appreciate the research and effort you do to write these articles. I just made this last night – it is absolutely delicious. It is over 100 degrees here and this was the perfect dinner on such a hot day. We added chilled shrimp and a squeeze of lime. I will be making this all summer long! Next time I will post a pic.